In one of the most unexpected delights in comics this year, 'Elsewhere' imagines the whereabouts of some famously unsolved disappearances into an enjoyable inter-dimensional fantasy. When we last left world famous aviator Amelia Earhart she was just introduced to a fellow prisoner, not her missing navigator Fred, but another notorious missing person, D.B. Cooper. Cooper hijacked a commercial airplane in 1971 and jumped out of the plane mid-flight. He was never found. But here he was imprisoned by Lord Kragen on the planet Korvath along with one of the most famous figures in history. They trade stories as to how they ended up on Korvath when Kragen summons Earhart and sends a sympathetic guard. 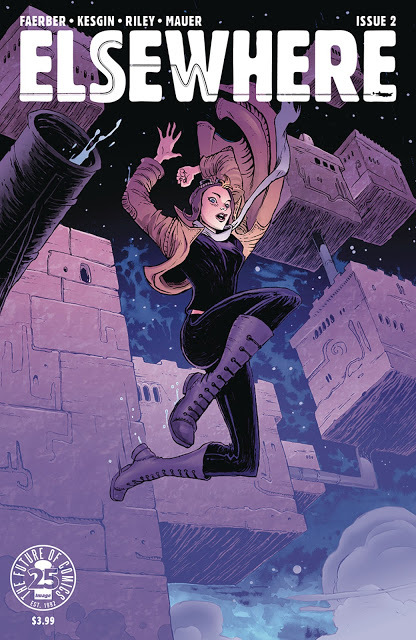 Jay Faerber has fun running with this imagined outcome for both Earhart and Cooper. You don't expect these two to gel but they do and you wonder what other famous people have entered this lost world. Faerber keeps the pacing brisk and the action thrilling. It's a popcorn movie in print where you can just lose yourself in the adventure. This piece of historical fiction is really an enjoyable read that doesn't demand too much from the reader and just unfolds in one fast-paced adventure. There are aspects of the story that may be familiar from a narrative point of view but there remain an innocence and an exuberance to taking liberties with real life figures and putting them in an extraordinary circumstance. 'Elsewhere' is a blast for all ages.